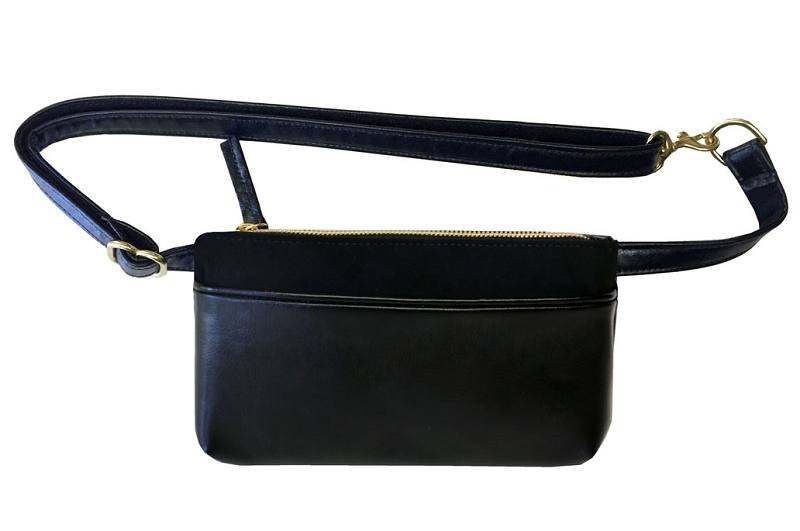 Our Pocket bum bag in soft vegan leather and premium Eco-Suede (made from recycled plastic bottles) features matching adjustable belt, and exterior pocket large enough to store your phone, cash, or keys. Convenient zipper top opens to reveal fully-lined interior of 100% organic cotton with an additional interior pocket for cards and cash. Handcrafted locally and sustainably in Los Angeles. Option of silver or gold hardware. I love this bag! I have been looking for a cool "fanny pack" for a long time. One look and I was sold. The freedom is absolutely amazing, I forget I am even wearing it. I would definitely recommend it. I am in love. Thank you for making a product that I am proud to wear. This bag is just large enough for all the essentials, looks sharp, and prevents me from losing my phone. I bought this just before ten days in London and used it everyday there, all day long. It was challenging to pare down (Oh! a comb, not a brush) and the only struggle was when I needed a second pair of glasses for the day (sun to interior). For this trip, coat and pants pockets helped. All the stylish women in London had big shoulder bags but I loved, loved, loved the no bag weight on shoulder and the elegance which sets it apart from being a "fanny pack." I have to say the only thing I regret is waiting so long to purchase! Love size! Love being hands free of holding on to a purse. I also like the fact of only traveling with the necessary things. I feel a sense of freedom for sure. I will be getting another one soon. I will also tell all my girlfriends it's time to downsize and stop being a prisoner unnecessary baggage! Thank you hipsters for sisters!!! This bag is wonderful. I carry a backpack and use both straps, yet I find it still bothers my neck/shoulders. This beautiful and large bum bag has been most helpful. The only challenge is letting go of the fear that I need to carry everything. 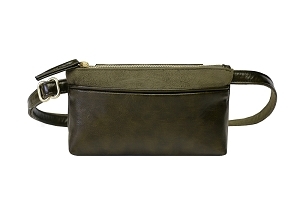 I adore this bag and my next will be the Leopard Flat Belt Bag once it is back in stock. This is my fourth HFS bag and the fifth I've purchased, having given one as a gift. It's the richest, most elegant and roomiest of all their bags. 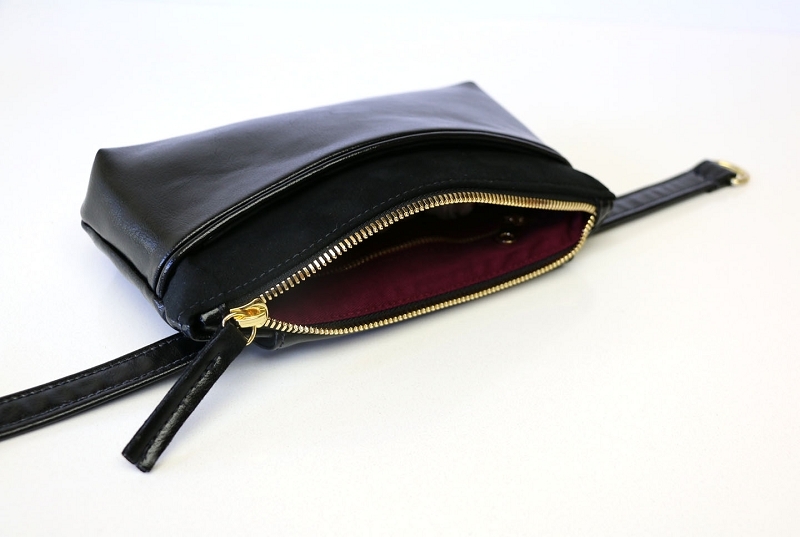 The design is minimalist, which I love, andt the contrast of the vegan suede and leather is gorgeous. The fabric is rich and supple, and the color makes it work for all seasons. Have you noticed that many designers have come out in the last year with their own versions of a belt bag? None are as flattering to wear, mold to the body as well, are made in the U.S. or are constructed of such superb vegan leather. Long live HFS! I wear this bag all the time. 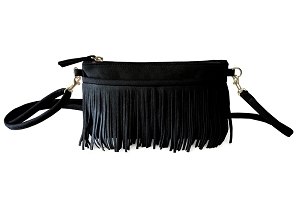 It's a really beautiful bag, love the combination of vegan leather and soft suede fabric. It looks very lux. Also love how much I can fit inside. The best part though is how many compliments I get while wearing it. Q: What is the length of the strap? A: The strap length adjusts from 26" to 48"
A larger strap which adjusts from 31" to 58" is currently available with gold hardware only. To order a bag with the larger belt, just note the request in the comments section of the order form and we will make sure to send the right one. We should have both options up on the website soon. Q: Does this bag also come with a strap? I am traveling to Thailand and Bali and want something that I can wear casually daytime around my waist, but also dressy at night on my shoulder - I like that this bag is roomier than the others. What do you recommend? 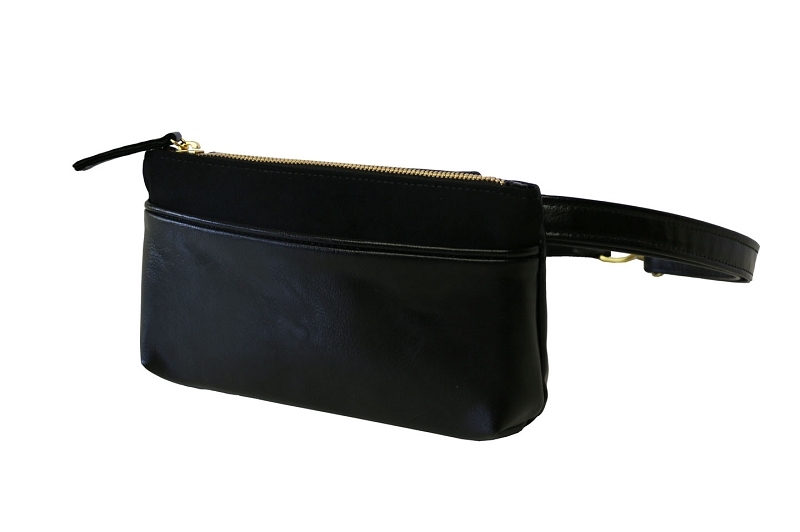 A: This is one of our very best selling bags but it only comes with a strap as it was designed to be worn around the waist or hips. 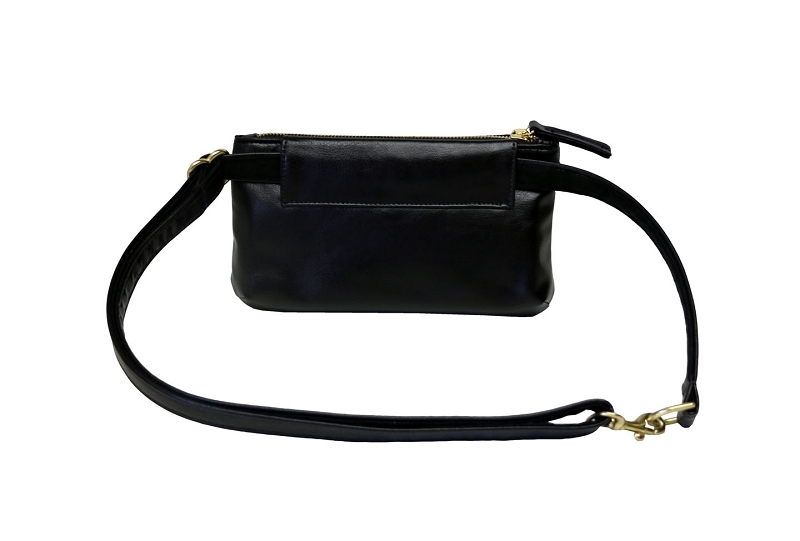 However, it could be worn as a shoulder bag if you have a chain from another bag or you can purchase one separately. Q: When will this bag be back in stock? Q: Are you guys planning to get more black bum bags w/ gold details back in stock? I'm in the states for a few more weeks and would love to get one before I leave again! Thanks!